Search Fairy is a program developed by Results Media Ltd. If you read the information provided on its official website, you will find out that this program promises to help you find the relevant information on the web very quickly. In order to do that, Search Fairy will offer you keyword suggestions and Wikipedia results. It might really seem that this program is beneficial; however, the truth is that it is completely untrustworthy. In fact, you might even infect your system heavily if you decide to keep it. If you do not want this to happen, make sure that you remove Search Fairy as soon as possible. Search Fairy says that it is not “spyware or malware and will not hurt any PC.” Actually, this is not exactly true. According to our security experts, this program is nothing more than just an advertising-supported application. This means that it is only going to show ads and it will not act beneficially. In fact, various ads generated by Search Fairy might even cause harm to your computer, so it is very important not to click on them. We think that you might click on these ads accidentally, so we suggest removing Search Fairy as soon as possible. You might see a new button added to the upper part of your browser if Search Fairy slithers onto your computer. If this button is not there and you still see ads, there is a possibility that there are other adware programs installed on your system as well. According to our security specialists, computer users sometimes download and install adware themselves because they think that they are very useful programs; however, it is more likely that adware programs enter a system together with other suspicious programs. It is very important to take care of your system’s security if you do not want this to happen again. The easiest way to do that is to install an antimalware tool on your system. 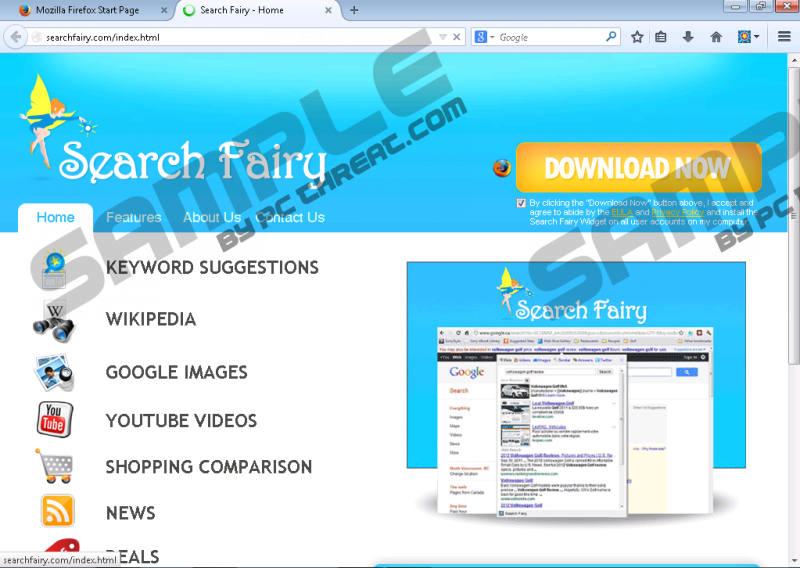 In order to fully remove Search Fairy, you have to delete it from Control Panel and then remove its extensions from Internet Explorer, Google Chrome, and Mozilla Firefox. We have prepared the manual removal instructions in order to show you how to do that. If you do not want to waste your time on the removal of Search Fairy, you should definitely scan your computer with SpyHunter or another trustworthy tool. We think that it is worth investing in a trustworthy tool because malware will not be able to enter your system in the future again. Right-click on Search Fairy and click Uninstall. Open your browser and tap Alt+T. Select the extension and remove it. Locate the extension associated with Search Fairy. Remove it from the system. Launch your browser and tap Alt+F. Select Tools (or More Tools) and click Extensions. Click on the extension and then click the recycle bin button. Quick & tested solution for Search Fairy removal.